It’s nearing the ten year anniversary of losing Danny. When he left us, he was two months past his eighteenth birthday, three months from graduating from high school. It was a snow day, and he was driving home from picking up his paycheck when his car hit a patch of ice on an overpass and crashed into a truck. Danny had been terrified of being in a car accident since he was a passenger in the car of a friend who totaled her car on the busiest street in Grand Rapids a couple years back. And for the longest time, that was what got to me the most, that he died in the scenario that scared him the most. I wasn’t there. I was in Fiji, in a remote village without plumbing and electricity on the pretense of researching mangrove harvesting practices, but really was just trying to figure out what the hell the purpose of my being put on this earth was. It had been a miserable week; I was homesick, my body crawled with parasites, and I had made the two-hour bus trip to the nearest town to make my twice-monthly call home—a call that cost $20FJ and lasted 4:40. I had felt something foreboding that morning, and called home eager to hear familiar voices. And then, Danny was gone. Passed away that morning, just a couple of hours before my call. And I remembered the last time I had seen him, right before I left for Fiji. I had made him a cherry pie for his birthday, spelled his name in cutouts across the crust. So far away, on a journey that was so full of soul searching and finding myself, this loss was devastating. The grief consumed me, reawakened all the other losses in my life. Danny was one of my closest friends from high school. He was a poet, a writer, a dreamer. He loved pie (especially pecan), red hoodies, cheese-filled breadsticks, and longed to see Samuel L. Jackson in a Star Wars movie wielding a purple light sabre years before it actually happened. On prom night, he climbed a tree in his purple-accented tuxedo. On my birthday, he gave me the last copy of Dharma Bums to be found in Grand Rapids, the price obscured on the back cover with hot pink nail polish. He hosted a Go Eat Pie in the Dark party, and we sat in his closet among his disc golf frisbees, Doc Martens, and talking drums sampling pies straight out of the pie tin with our spoons. He, with our little group of friends, made high school bearable. I’ve since made peace with many of the ghosts and demons of my past. And Danny, always a prankster, and always one to reassure, visits from time to time, letting us know he’s okay. Zan relates how she once felt him sneaking up on her in the shower, and yelled at him for being a peeping tom. Amul says one night at Stanford after a phone call with me, he was thinking about “Kira’s friend Danny” when the lights flickered off and on. Danny hated shoes, and whenever we would sit cross-legged in a circle in the grass, his toes would unconsciously wiggle back and forth at a frenetic pace. In a shack in the Fijian village while I cried and grieved, a spasm started in the tendon stretching across the arch of my foot, and my toes began dancing on their own. Because I couldn’t be there, he came to me—let me know he was okay, let me say my goodbyes. I miss him still, and he occasionally visits, making my toes twitch on their own accord. And even though we lost him so long ago at such a young age, he has defined who we are today. His legacy continues through us—what we love, what we fight for. Maybe it was the heat that day. Or the catcalls rolling from the market. I was supposed to be the missing one. chirruped elegies from the rafters. float out to sea for you. I'm taking a course this semester on Native American/indigenous cultural production and space to help me with my approach in my own research on cultural productions by Korean birth mothers and single mothers. The first book for the class arrived in the mail today, courtesy of Amazon marketplace: "The Surrounded" by D'Arcy McNickle. 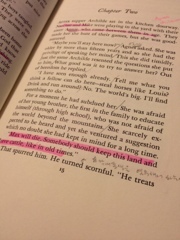 And in a little twist of irony, the highlights and notes in the margins by the previous owner of this book are in Korean.